Yeti tumblers are among the most popular tumbler on the market today. The top selling Yeti tumblers include the 30oz Yeti Rambler as well as their smaller sized 20oz Rambler Tumbler. Some close alternative competitors to Yeti include rTic, Ozark, and Starbucks. While Yeti’s do come with a lid, they do not come with a reusable straw and if they do, it’s a cheap plastic straw. There are several zero waste reusable straw options made from plastic, stainless steel metal, glass and silicone — each with their own advantages and disadvantages, such as being the right length, BPA free, and safe for kids and dishwasher ready. Below we discuss what is the best reusable straws for Yeti Rambler Tumblers. 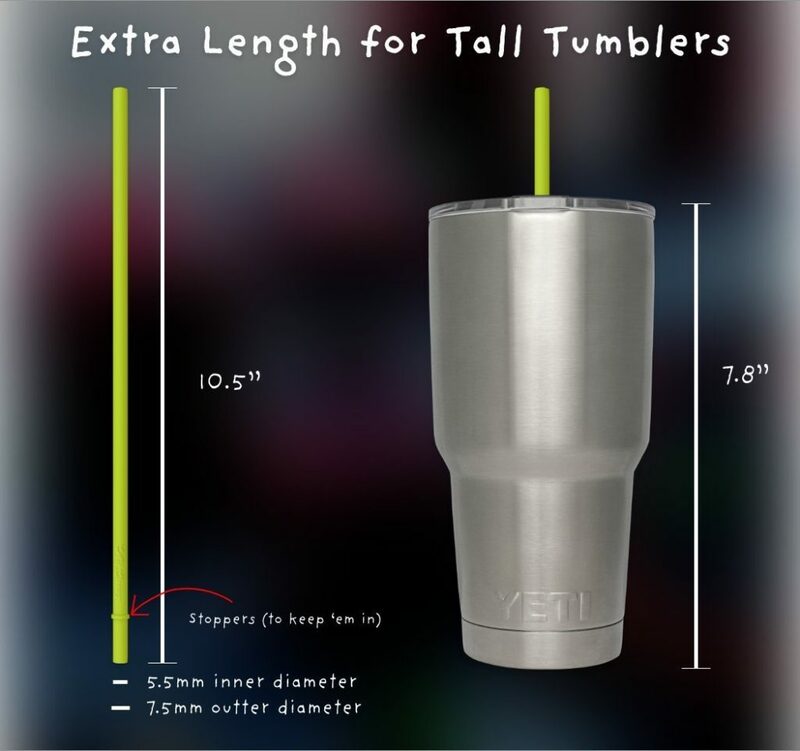 The ideal height of a straw for your Yeti tumbler is the height plus an additional 2 – 3” for ideal drinkability. This means, for a 20oz Yeti tumbler, the ideal straw length is around 8” to 9”. For a 30oz Yeti Tumbler, the ideal straw length is 10” – 11”. The safest straws in terms of being non-toxic and safe for kids are made from silicone. Glass, metal, and plastic straws are hard – which can result in chipped teeth, poked eyes, and throat gouges. This entry was posted in Blog and tagged 20oz, 30oz, reusable straws, rTic tumbler, yeti tumbler.